inlet hose 1.4M universal. suits virtually all washing machines except USA manufactured ones such as GE/Kleenmaid/Whirlpool/Amana/Maytag. brands include simpson fisher & paykel westinghouse hoover electrolux miele LG samsung omega smeg blanco asko ariston and many many more. The tail (screw on part) which screws onto the tap and to the machine is available in red, white or blue. 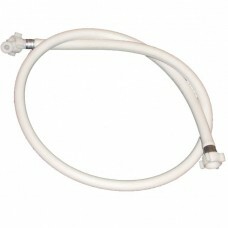 Even though the hoses are all the same it is useful to assist you to differentiate the hot and cold hose. the hose material itself is white in all cases.